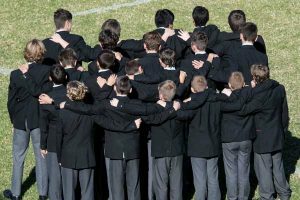 As a Catholic School in the Edmund Rice Tradition, we provide pastoral care that nurtures the dignity of each person as uniquely reflecting the image of God. On Friday March 15, schools across the nation participated in events to promote the National Day of Action against Bullying and Violence. Senior students from the College delivered a moving presentation at our Friday assembly, highlighting the impact that bullying can have on young people. The presentation provided detailed information regarding the extent to which bullying is occurring amongst young people, sending a clear message that this type of anti-social behaviour is not acceptable at school and in the wider community. Importantly, there was clear advice also provided to victims of bullying on how to gain support. St Edward’s College is challenged by our Charter for Edmund Rice Schools to provide a safe and inclusive learning environment. Bullying of any form is not acceptable and we attempt to be proactive in putting in place measures that raise student awareness about the issues of bullying as well as strategies that are designed to deal with issues when they arise. Unfortunately, bullying behaviour can be underhanded and young people can feel embarrassed, scared or unsure of how to respond. Units of work are delivered in the PD/H/PE program and the Student Wellbeing program, which provide students with strategies on how to respond to bullying and support those that they witness being bullied. A range of procedures implemented at St Edward’s are designed to assist the Pastoral team in identifying bullying behaviour and victims of bullying. Students complete an anonymous online survey twice a year providing staff with valuable information about bullying behaviour. Students, parents and carers are also able to email the College at bullying@stedwards.nsw.edu.au to provide information to the Director of Pastoral Care regarding any concerns that may exist. Recent times has seen a dramatic increase in Cyberbullying which is causing many young people great distress. Cyberbullying can occur in many ways including: abusive texts and emails, hurtful messages, images or videos, imitating others online, excluding others online, humiliating others online, nasty online gossip and chat. Parents and carers should not feel alone in attempting to deal with this. The College can provide great support to victims of cyberbullying that is occurring while our young people are at home. 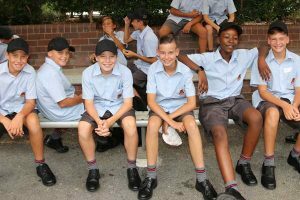 Parents are encouraged to contact the relevant Year Pastoral Leader for advice and support if they are concerned about their son being exposed to bullying of any description. The College’s approach to dealing with bullying behaviour is outlined on the College website at: https://www.stedwards.nsw.edu.au/pastoral-care/bullying/. Parents and carers who are interested in gaining further advice are also encouraged to visit the Australian Government E-Safety Commissioner website at https://www.esafety.gov.au/parents for practical tips on how to support your child in dealing with cyberbullying. The College is now accepting enrolment applications for Year 7 2020. The enrolment process is now completed online via the College website at: https://www.stedwards.nsw.edu.au/news/enrolment-for-year-7-2020-now-open/. The enrolment information clearly outlines the enrolment criteria. Applications received after Monday April 8 will be processed as late applications. Every family applying for their son to attend St Edward’s will be offered an interview with a member of the College Leadership Team. This interview is designed to provide parents with an opportunity to ask questions that are more specific about the College and enrolment process. Places at the College are not offered at these interviews and first round letters of offer will be mailed to families by the end of Term 2. Current families who are aware of family or friends who wish to apply for their son to attend St Edward’s are asked to encourage them to visit the College website for information about the College and the process of enrolment. Leadership Portfolios: Included in the role of Prefect is the involvement in one of the College Leadership Portfolios. These portfolios see teachers working with students in the organisation of a variety of activities that occur throughout the year. Students from all year groups are encouraged to become members of these portfolios. In doing so, they are able to develop excellent leadership qualities in organisation, public speaking and promotion. Students who aspire to a prefect role at St Edward’s are required to have been a member of one of the portfolios throughout Years 10 and 11. The portfolios are: Spirituality, Liturgy and Social Justice; Culture Publicity and Social Events; Environment, Sport and Healthy Lifestyle; Literacy and Academia. Leader’s Badge: Students in Years 10, 11 and 12 can apply for a Leader’s Badge. The awarding of these badges acknowledges student participation in a range of extra-curricular activities. 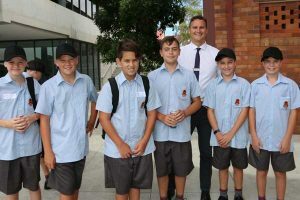 Students can apply to their Pastoral Leaders for these badges – Year 11 and 12 from the beginning of the year and Year 10 students from the start of Term 2. The awarding of these badges also promotes the College’s view that you do not need to be a College Prefect to be considered a leader in the school. Year 11 Max Potential Program: The Max Potential program is an initiative of Clubs NSW which offers twenty-two weeks of personal leadership development, including coaching to young leaders from schools, TAFE, University and the community to help them maximise their potential during the final years at school and beyond. Max Potential also encourages students to focus on the local community and ways that they can develop a program to serve the community. Participants in this program are allocated a mentor who guides them in the development, promotion and implementation of an initiative designed to assist members of the local community. 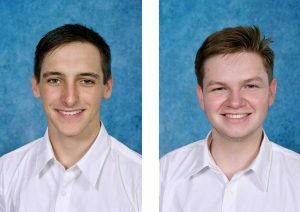 This year we have two Year 11 students, Sam Dewey and Jackson Robb, participating in the program and I am sure that these boys will find the program to be challenging and rewarding and we wish them well. 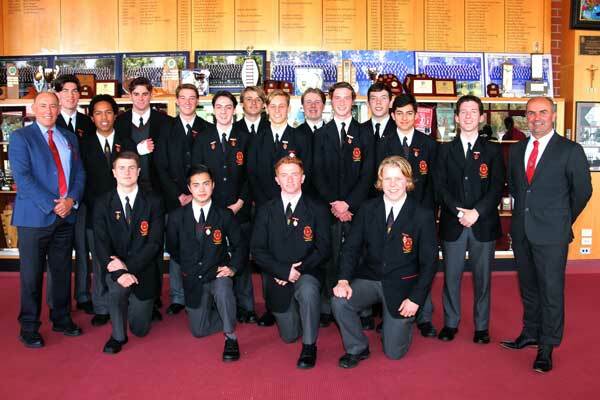 Edmund Rice Education Beyond Borders (EREBB): St Edward’s College is a Lead School in the Edmund Rice Education Beyond Borders (EREBB) initiative. EREBB is an international network of Catholic schools educating young people from many different faiths and cultures. In over 20 countries, we endeavour to promote global solidarity and offer a transformational education for justice and liberation. Mrs Toomey and Mrs Pearson lead this group at St Edward’s. Students from all year groups are welcome to join this group and work on making connections with our brother and sister schools worldwide. One of the initiatives available to Year 11 students under the EREBB banner is the annual Kenya Immersion experience to be held in the September school holidays this year. Completion of Waterford: One of the major aims of the College’s Waterford Project is to provide students in Years 8-11 the opportunity to develop leadership skills. Completion of these hours fosters in students an understanding of the servant leadership example of Jesus. Application, Effort and Leadership: Students are encouraged to demonstrate leadership throughout their every day school life. Students can lead by example in class, on retreats and camps, on the sporting field and excursions. This approach to leadership promotes the notion that “true leaders demonstrate leadership all the time”. College Prefect: Students in Year 11 who have aspirations for leadership are encouraged to apply for a position of College Prefect. Year 11 students are elected to this role by staff and students and continue in the position until Term 3 of the HSC year. Students elected as Prefects provide wonderful service to the College community through leading weekly assemblies, representing the College at important Religious and cultural community events, volunteering at Open Day, assisting in the organisation of College carnivals and discos. The role of College Prefect allows students to develop public speaking, leadership, organisation and promotional skills.